Sega Ages is an arcade compilation disc from Sega featuring 3 classic arcade titles; OutRun, Afterburner II, and Space Harrier. All three games are arcade-perfect translations and include options menus which allow you to alter the control scheme, adjust the difficulty level, and listen to music and sound effects, plus a few options specific to each game. While the games themselves are perfectly presented, the game selection is severely lacking, which I suspect is because they had intended to release additional “Sega Ages” discs as they did in Japan. Admittedly, I am not much of a fan of Afterburner II, which is really only fun when I’m sitting in a full-size arcade machine. 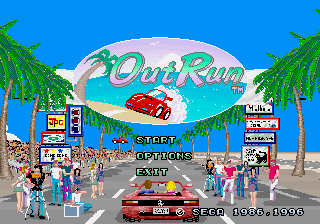 Space Harrier is a fun game, but really this compilation’s selling point is the arcade-perfect port of OutRun, which was actually released as a stand-alone disc in Japan. Of course, in the 32-bit generation, nickel-and-diming consumers with ultra-lean arcade collections was the name of the game with series like the Namco Collections and Arcade’s Greatest Hits doing little to take advantage of the increased storage capacity of the CD-ROM, instead banking on gamers’ willingness to pay full price for a paltry three classic arcade games. Equally disheartening is Sega Ages’ complete lack of bonus material of any kind. One needs only to look to the “Capcom Generations” series on the Saturn, which sadly never made it to the United States, to see an arcade compilation done right. While each of those discs only contain a handful of games, the litany of bonus material make them the definitive collection of their respective games. Sega Ages would be tempting were it a common, sub-10 dollar title, but the price it commands due to its rarity make it an unattractive option for someone just looking for a retro compilation to play. Buy Sega Ages on GameGavel or Amazon. Tagged Afterburner II, Arcade, Compilation, OutRun, Review, Saturn, sega, Sega Ages, Space Harrier, Working Designs. Bookmark the permalink.